Merbromin is an antiseptic cream that is topically applied to cuts and scrapes to prevent infection. The drug used to be sold as Mercurochrome, Cinfacrom, and Stellachrome among others. 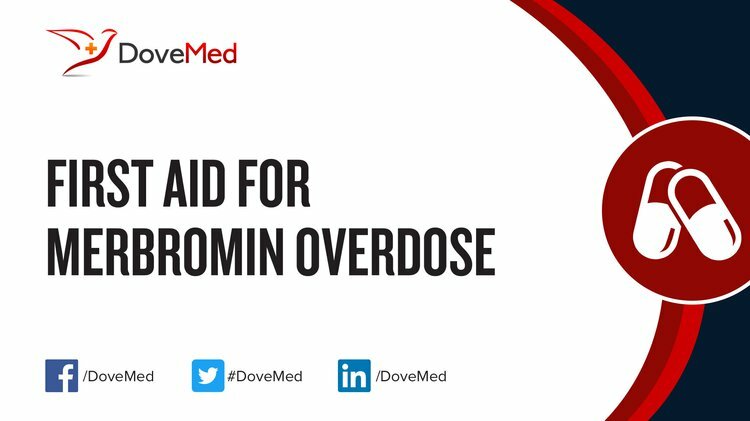 Merbromin Overdose is the accidental or intentional intake of the drug in dosage higher than recommended. Note: It is not sold in the United States since 1998, Germany since 2003, and France since 2006, due to concerns about the mercuric content of the drug. What are the Causes of Merbromin Overdose? What are the Signs and Symptoms of Merbromin Overdose? The signs and symptoms of Merbromin Overdose can vary from one individual to another. It may be mild in some and severe in others. Several systems of the body, such as the digestive system, respiratory system, nervous system, urinary system, skin and ENT may be affected. How is First Aid administered for Merbromin Overdose? Who should administer First Aid for Merbromin Overdose? First aid for Merbromin Overdose is administered by healthcare professionals. What is the Prognosis of Merbromin Overdose? How can Merbromin Overdose be Prevented? Navrátil, T., Svancara, I., Mrázová, K., Novakova, K., Sestakova, I., Heyrovsky, M., & Pelclová, D. (2011). Mercury and mercury electrodes: the ultimate battle for the naked existence (a consideration). Sensing in electroanalysis, 6, 23-53. Nishizawa, M., Imagawa, H., & Yamamoto, H. (2010). A new catalyst for organic synthesis: mercuric triflate. Organic & biomolecular chemistry, 8(3), 511-521. Ismail, Z., Primasari, B., & Shirazi, S. M. (2011). Monitoring and management issues of heavy metal pollution of Gombak River, Kuala Lumpur. International Journal of Physical Sciences, 6(35), 7961-7968. Vaughan, E. H. (2015). Community under stress. Princeton University Press. McNeely, M. D., & Brigden, M. L. ROUTINE URINALYSIS What is a routine urinalysis?. Wang, D., Huang, S., Liu, P., Liu, X., He, Y., Chen, W., ... & Chen, H. (2016). Structural Analysis of the Hg (II)-Regulatory Protein Tn501 MerR from Pseudomonas aeruginosa. Scientific reports, 6, 33391. ASIAMAH, G. (2013). DEPARTMENT OF THEORETICAL AND APPLIED BIOLOGY (Doctoral dissertation, KWAME NKRUMAH UNIVERSITY OF SCIENCE AND TECHNOLOGY).